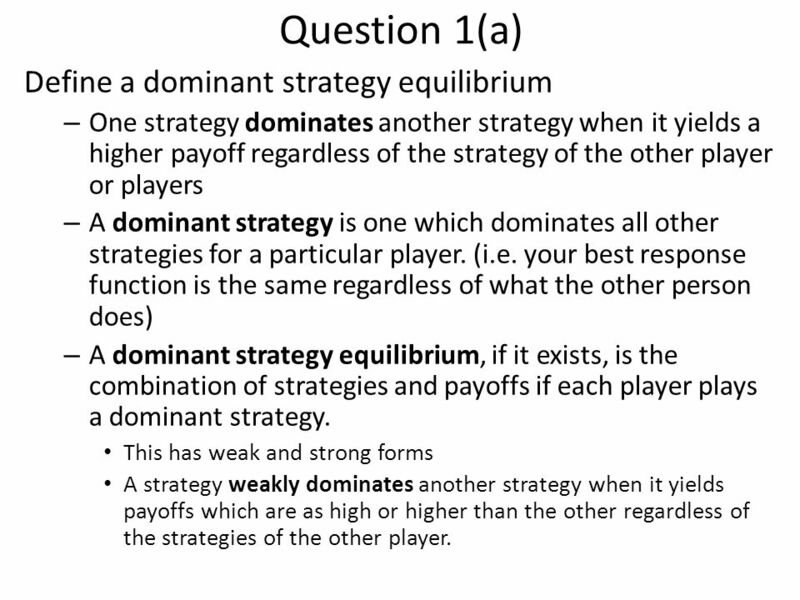 2 Question 1(a) Define a dominant strategy equilibrium – One strategy dominates another strategy when it yields a higher payoff regardless of the strategy of the other player or players – A dominant strategy is one which dominates all other strategies for a particular player. (i.e. 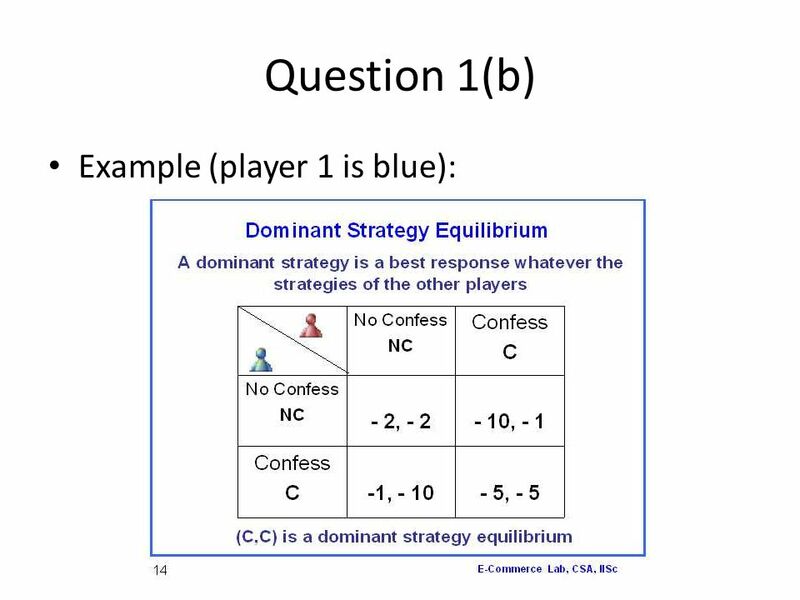 your best response function is the same regardless of what the other person does) – A dominant strategy equilibrium, if it exists, is the combination of strategies and payoffs if each player plays a dominant strategy. This has weak and strong forms A strategy weakly dominates another strategy when it yields payoffs which are as high or higher than the other regardless of the strategies of the other player. 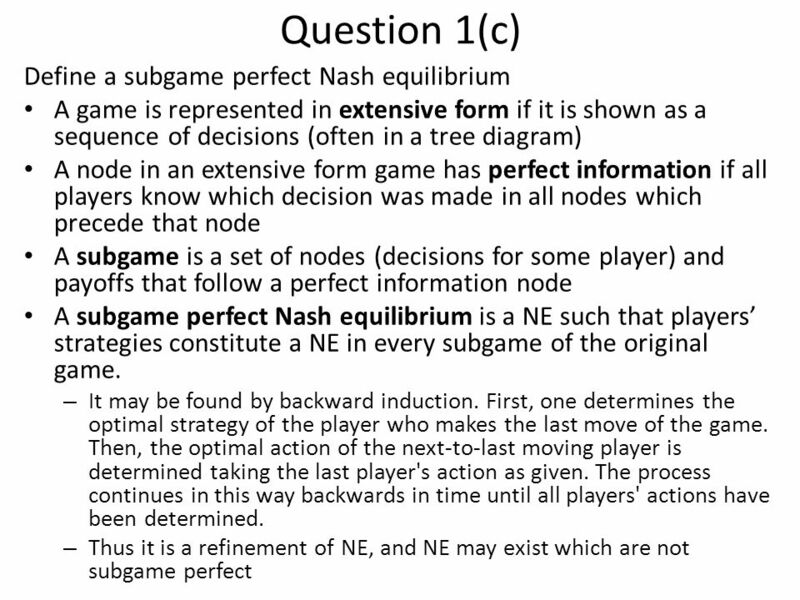 4 Question 1(b) Define a Nash equilibrium – A best response function A function which returns the strategy with the highest payoff given the action of the other player – A mutual best response When all players play best response strategies – A Nash Equilibrium is a situation where economic actors each choose their best strategy given the strategies that all other actors have chosen (so in short, Nash Equilibrium is a mutual best response) – In other words, a Nash equilibrium is a set of strategies, one for each player, such that no player has incentive to change his or her strategy given what the other players are doing. 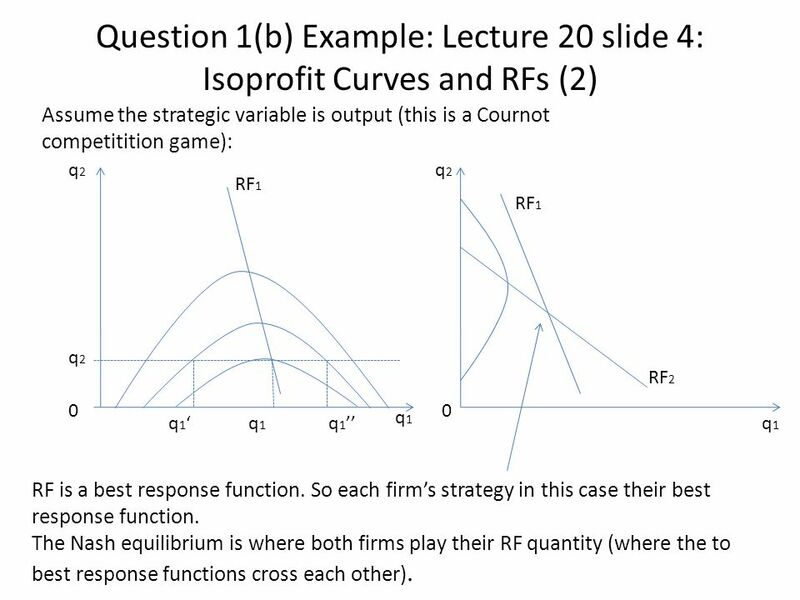 5 Question 1(b) Example: Lecture 20 slide 4: Isoprofit Curves and RFs (2) Assume the strategic variable is output (this is a Cournot competitition game): q2q2 0 q1q1 RF 1 q2q2 q 1 ‘q 1 q 1 ’’ RF 2 q2q2 0 q1q1 RF 1 RF is a best response function. So each firm’s strategy in this case their best response function. The Nash equilibrium is where both firms play their RF quantity (where the to best response functions cross each other). 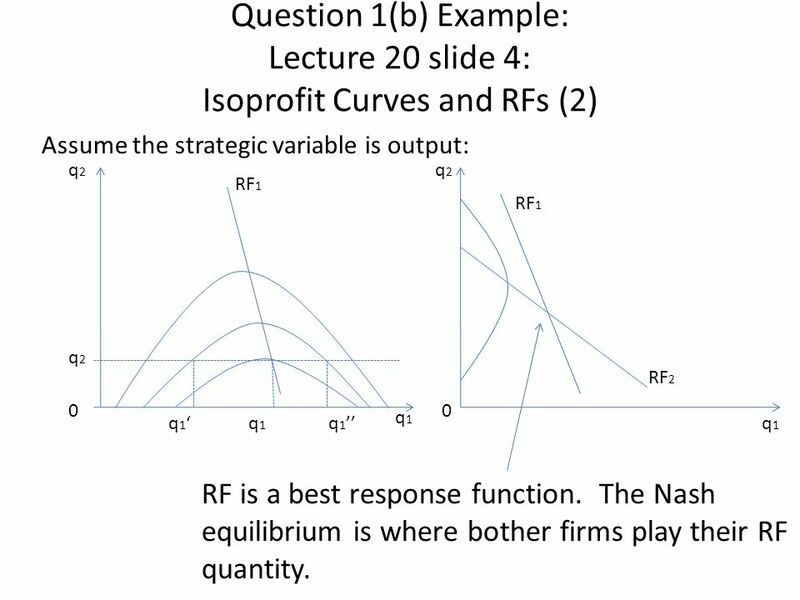 11 Question 1(b) Example: Lecture 20 slide 4: Isoprofit Curves and RFs (2) Assume the strategic variable is output: q2q2 0 q1q1 RF 1 q2q2 q 1 ‘q 1 q 1 ’’ RF 2 q2q2 0 q1q1 RF 1 RF is a best response function. 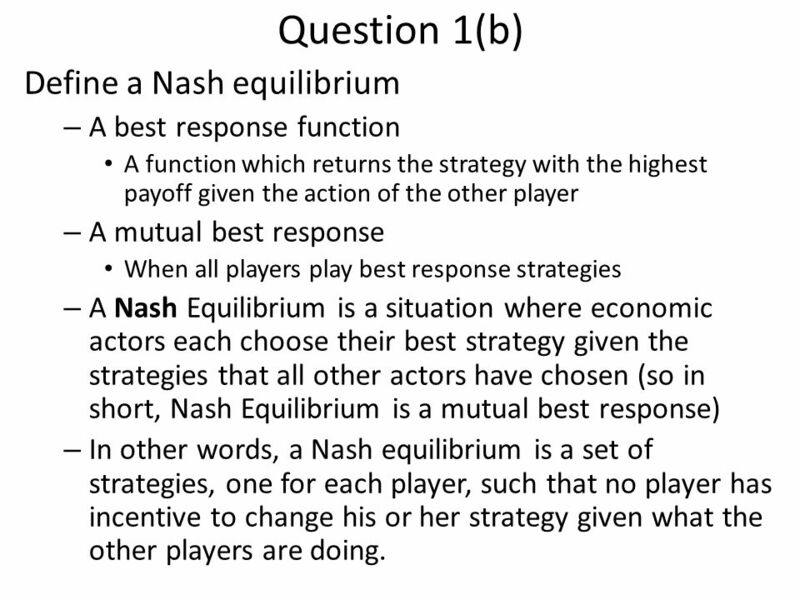 The Nash equilibrium is where bother firms play their RF quantity. 14 Question 2(c) Assume MC constant, MC = AC. The 45° line represents where firm1’s price = firm2’s price. Let’s first consider Player 1’s best response function. 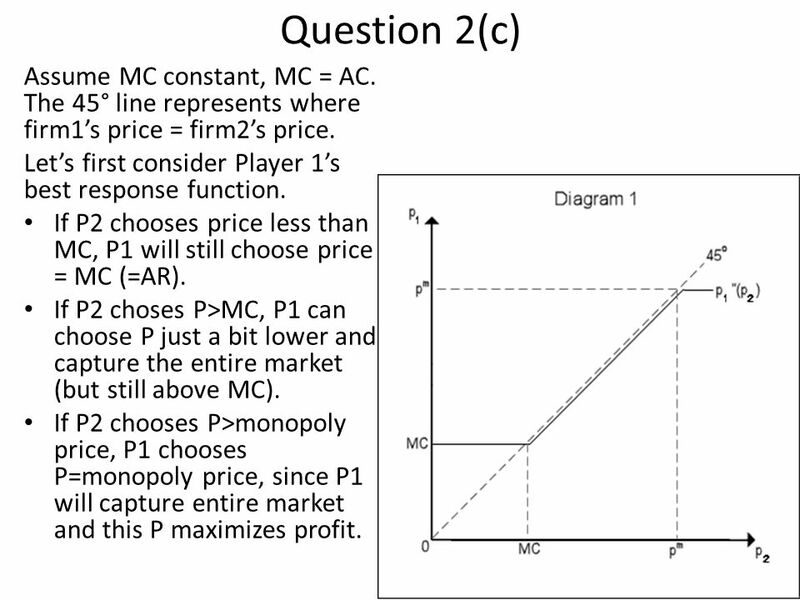 If P2 chooses price less than MC, P1 will still choose price = MC (=AR). If P2 choses P>MC, P1 can choose P just a bit lower and capture the entire market (but still above MC). If P2 chooses P>monopoly price, P1 chooses P=monopoly price, since P1 will capture entire market and this P maximizes profit. 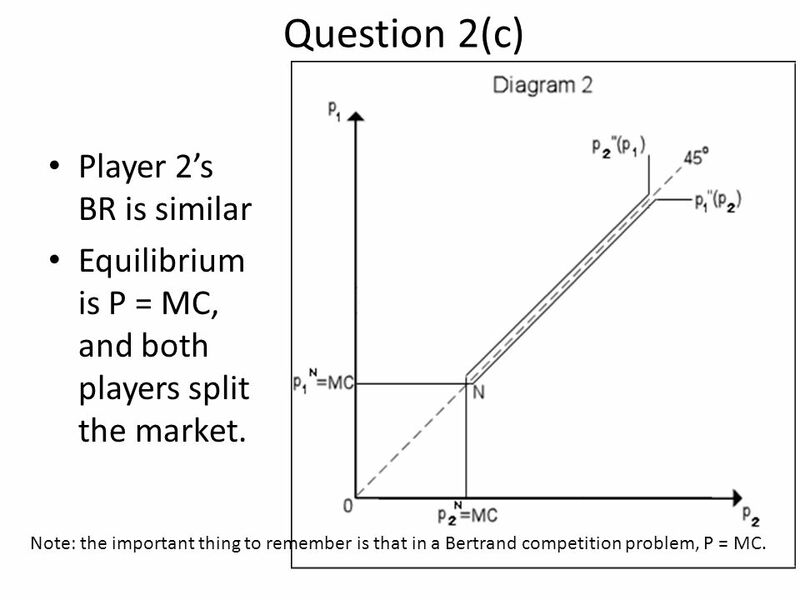 15 Question 2(c) Player 2’s BR is similar Equilibrium is P = MC, and both players split the market. Note: the important thing to remember is that in a Bertrand competition problem, P = MC. 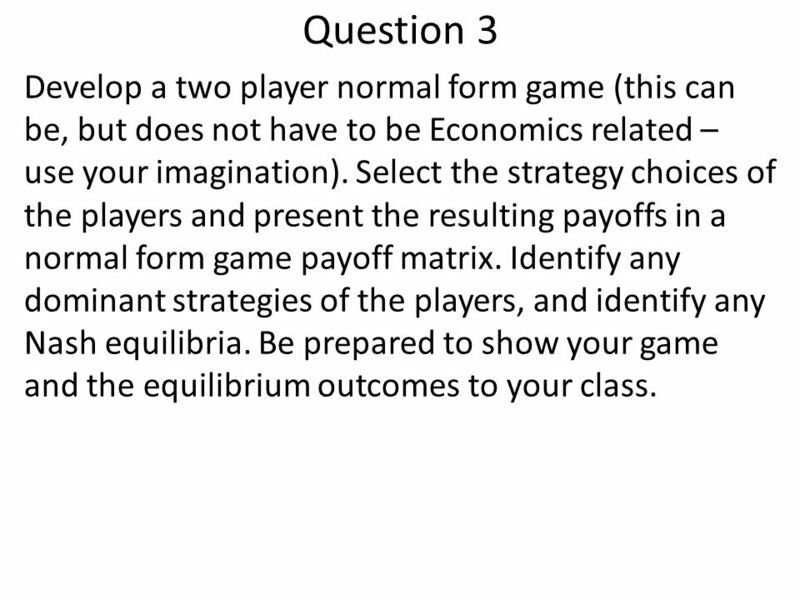 17 Question 3 Develop a two player normal form game (this can be, but does not have to be Economics related – use your imagination). Select the strategy choices of the players and present the resulting payoffs in a normal form game payoff matrix. Identify any dominant strategies of the players, and identify any Nash equilibria. Be prepared to show your game and the equilibrium outcomes to your class. 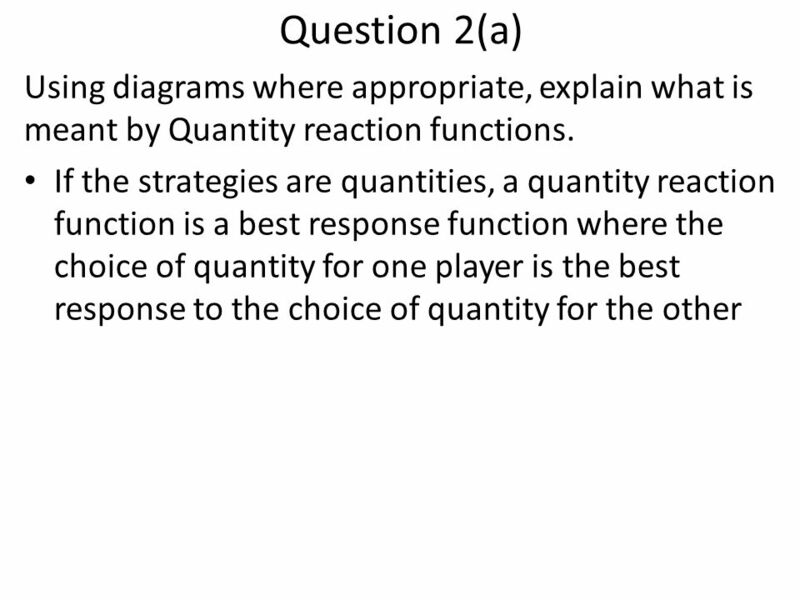 18 Question 4 Develop a two player extensive form game (this can be, but does not have to be Economics related – use your imagination. 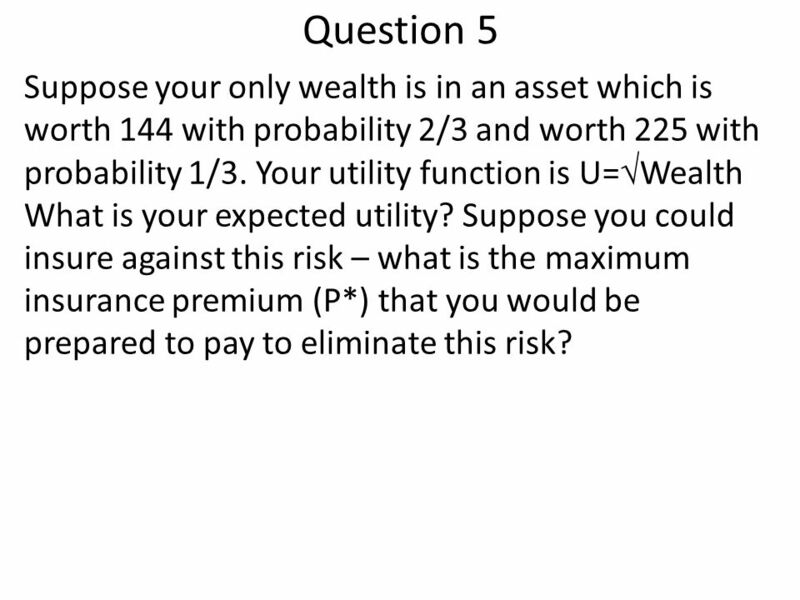 It can but does not need to be related to the game created in Question 3). Decide the number of periods, indicate the strategy choices of the players and the resulting payoffs. 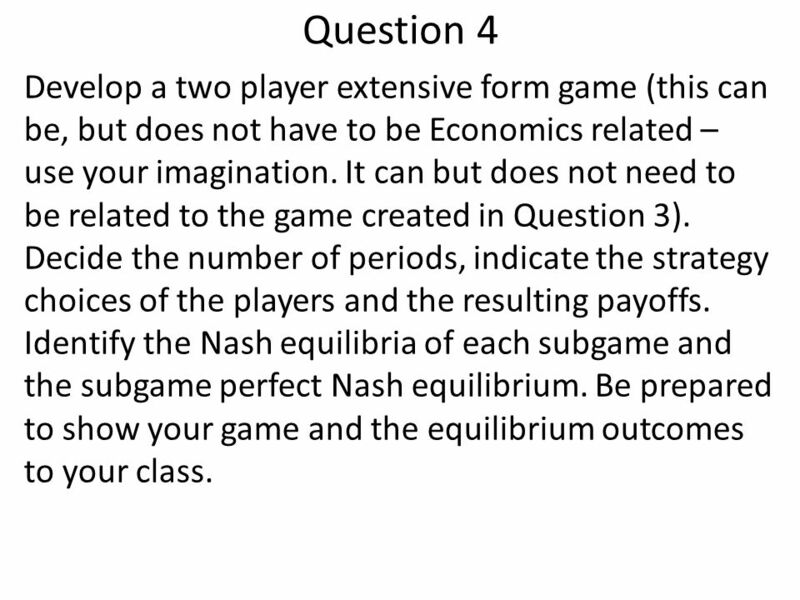 Identify the Nash equilibria of each subgame and the subgame perfect Nash equilibrium. Be prepared to show your game and the equilibrium outcomes to your class. 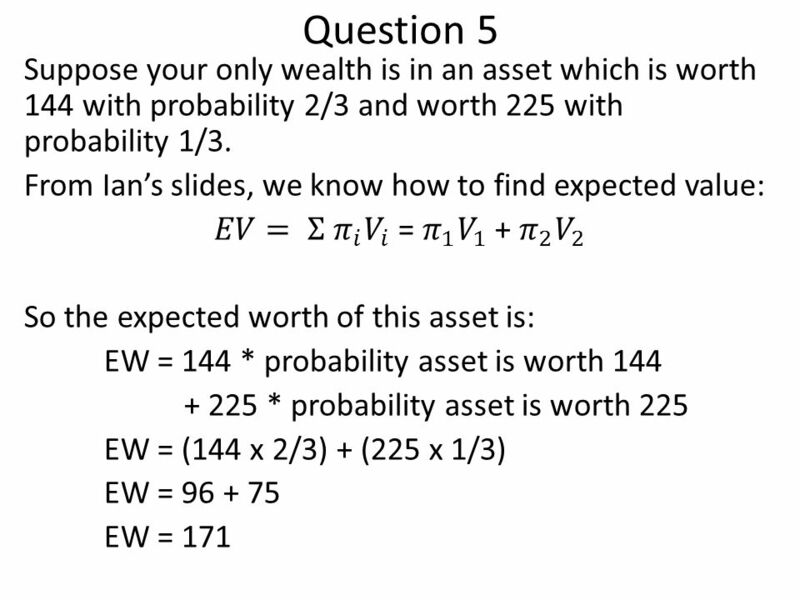 19 Question 5 Suppose your only wealth is in an asset which is worth 144 with probability 2/3 and worth 225 with probability 1/3. 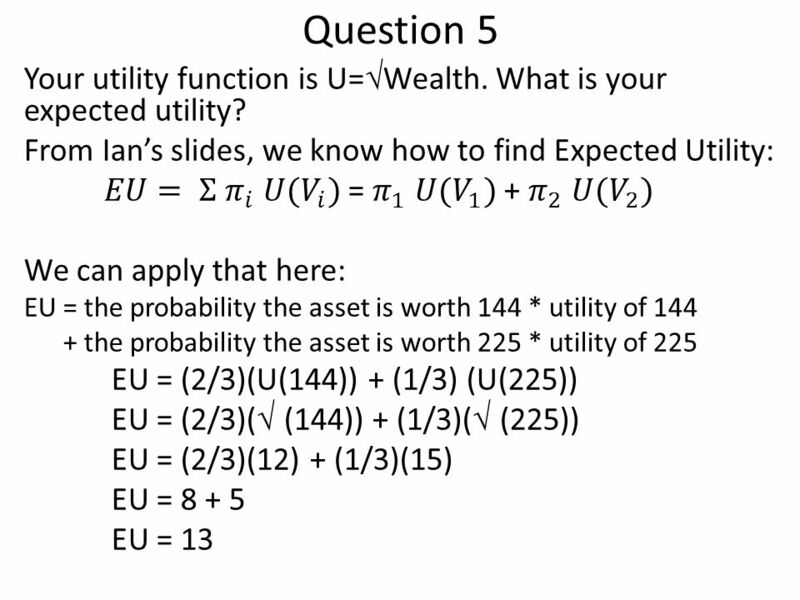 Your utility function is U=  Wealth What is your expected utility? 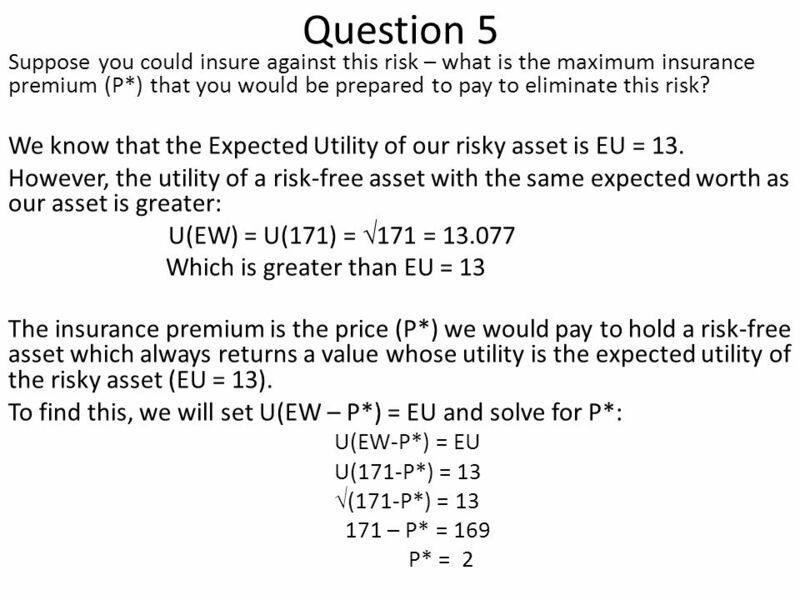 Suppose you could insure against this risk – what is the maximum insurance premium (P*) that you would be prepared to pay to eliminate this risk? 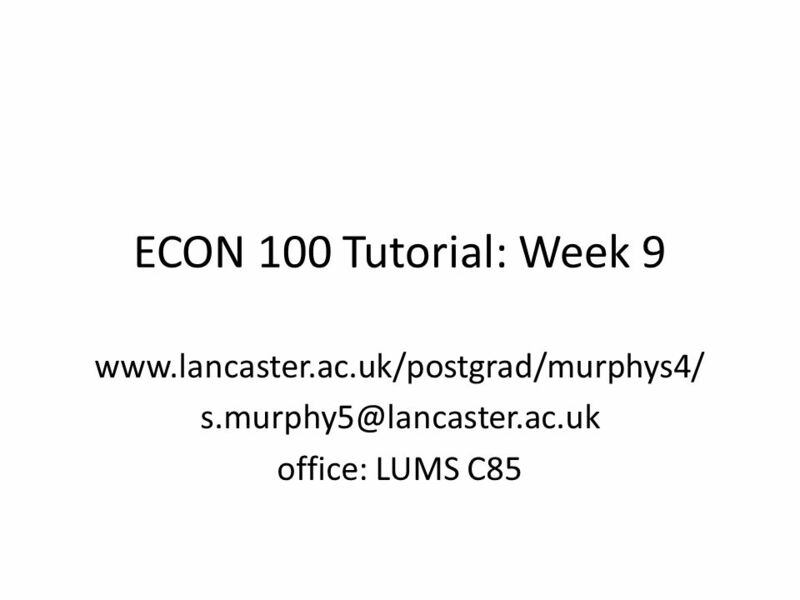 Download ppt "ECON 100 Tutorial: Week 9 office: LUMS C85." Oligopoly A monopoly is when there is only one firm. 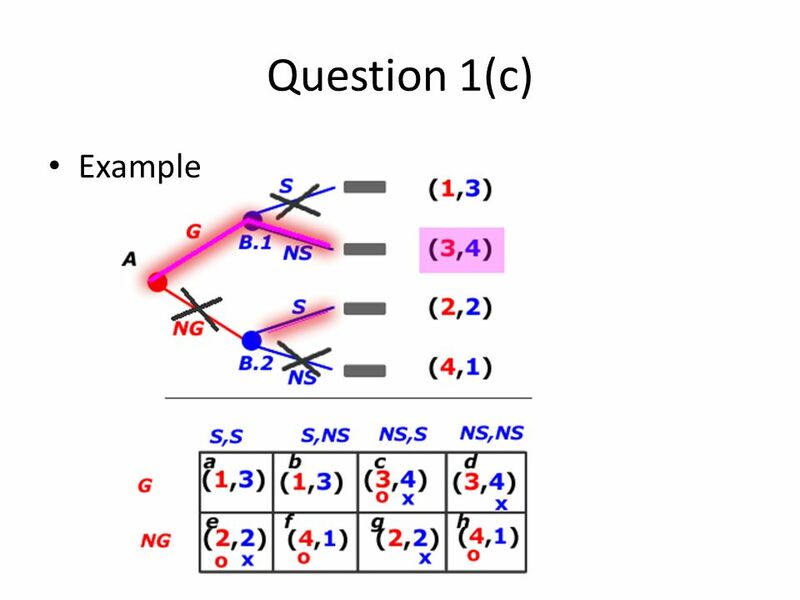 © 2009 Institute of Information Management National Chiao Tung University Game theory The study of multiperson decisions Four types of games Static games. 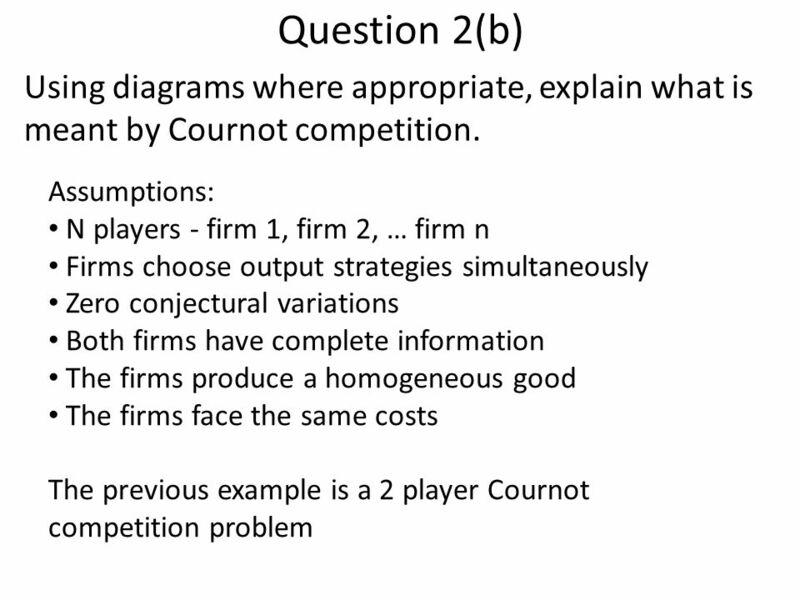 Stackelberg -leader/follower game 2 firms choose quantities sequentially (1) chooses its output; then (2) chooses it output; then the market clears This. Product Differentiation When firms produce similar but differentiated products, they can be differentiated in two ways: Vertical Differentiation. 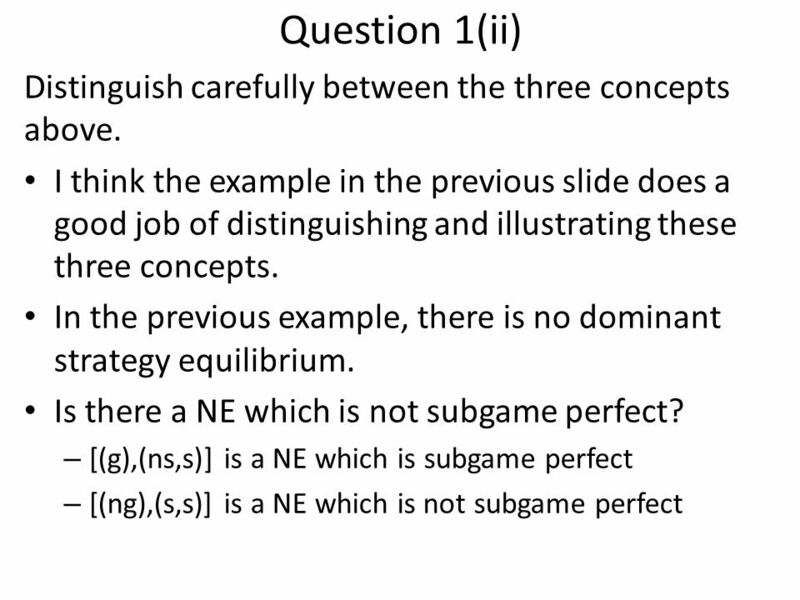 ECO290E: Game Theory Lecture 9 Subgame Perfect Equilibrium. 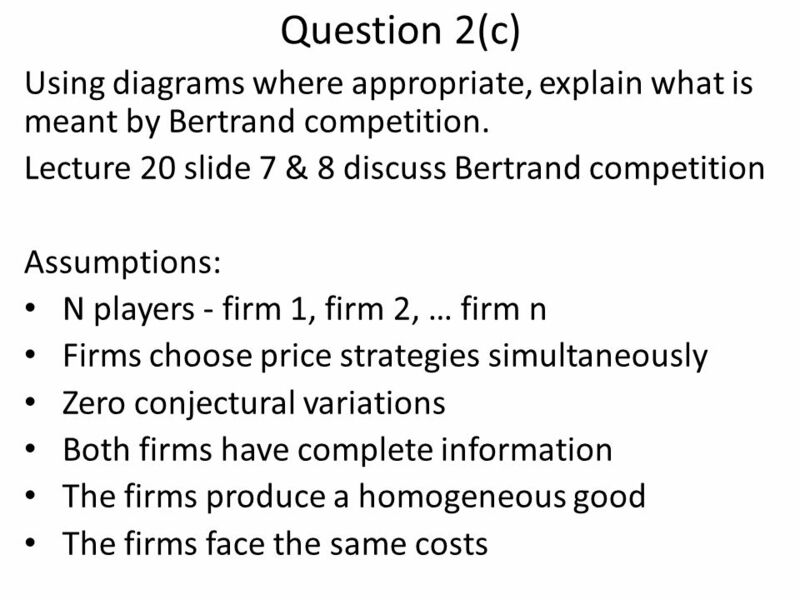 ECO290E: Game Theory Lecture 4 Applications in Industrial Organization. Copyright © 2010 by the McGraw-Hill Companies, Inc. All rights reserved. McGraw-Hill/Irwin Managerial Economics & Business Strategy Chapter 9 Basic Oligopoly. 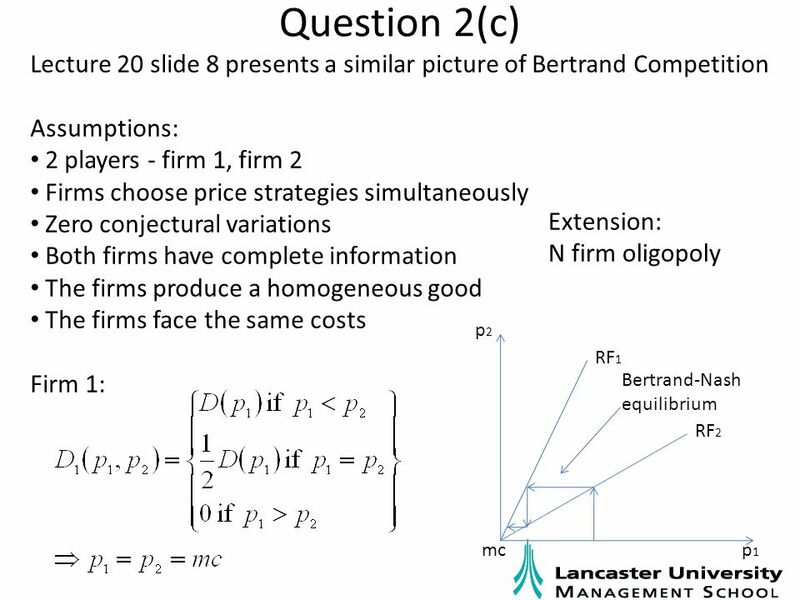 Microeconomics 1000 Lecture 13 Oligopoly.